Hand painted and meticulously assembled to simulate human anatomy. 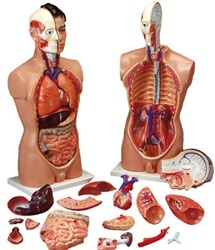 Dissects into 19 parts: torso, head (2-parts), brain, lung, (4-parts), heart, trachea, esophagus and descending aorta, diaphragm, stomach, duodemum with pancreas and spleen, intestines, cecum, kidney, bladder (2-parts), liver. Mounted on a base. Size: 33-1/2" tall. Choking Hazard: Small Parts. Not for children under 3 years.